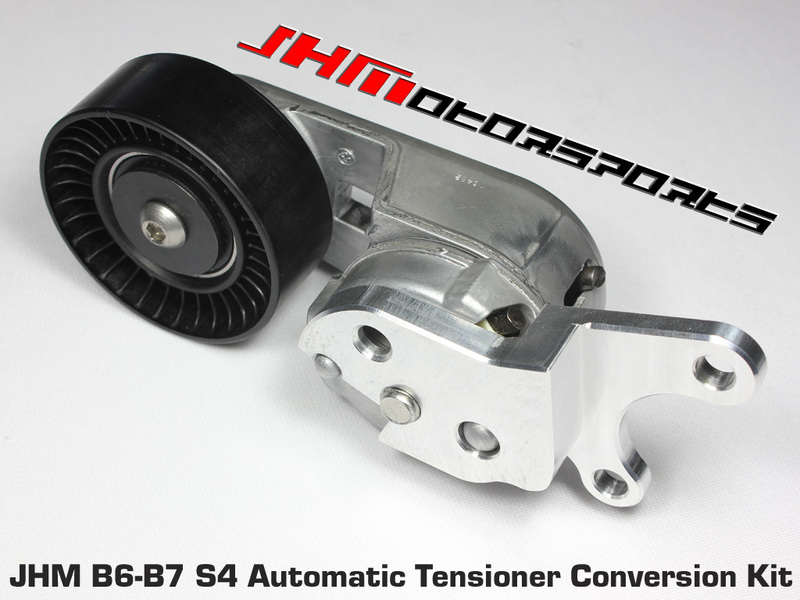 Introducing the JHM Automatic Tensioner Conversion Kit for the B6-B7 S4 and C5-allroad 4.2L!!! Our continued dedication to the B6-B7 S4 and C5-allroad 4.2L has led to the release of another innovative product for the platform. 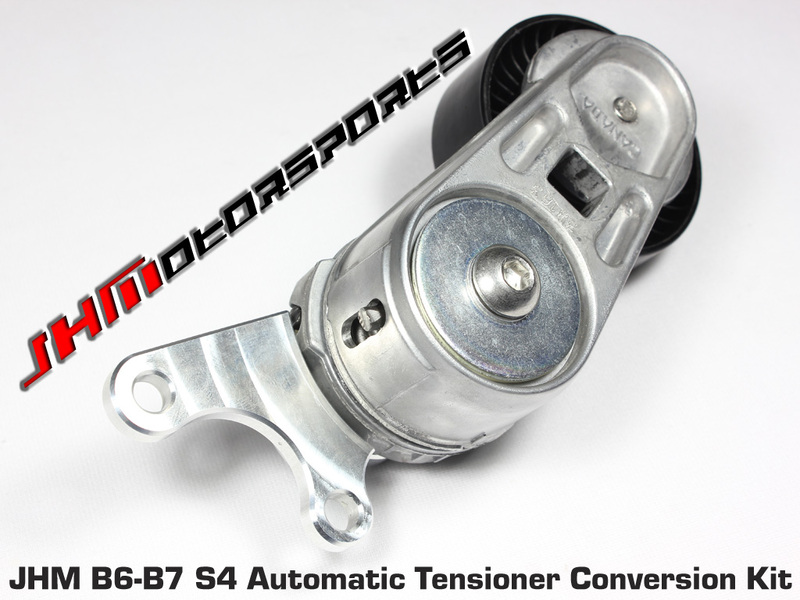 Now there is FINALLY a better solution for replacing the OEM Alternator Belt tensioning setup. We have developed a solution that will replace the expensive, non-automatic tensioning OEM parts on your B6-B7 S4 and C5-allroad 4.2L. 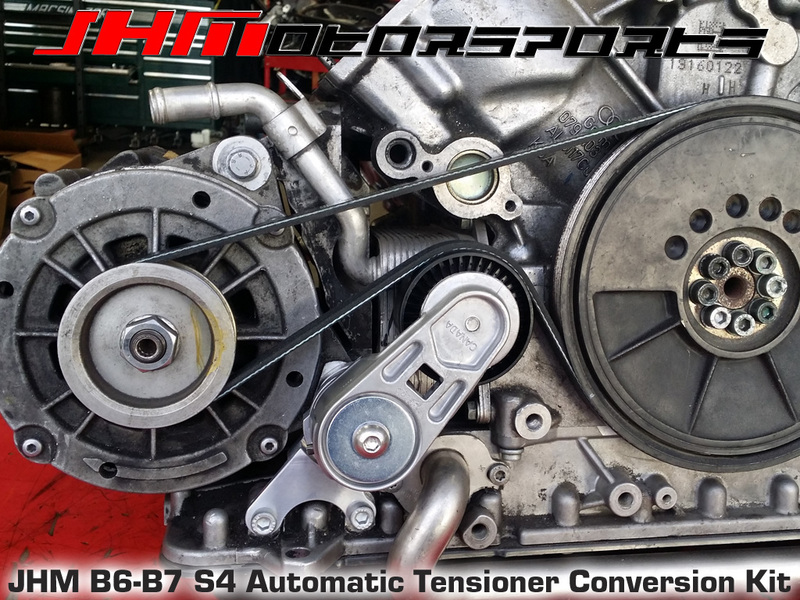 Developed during our ongoing advancement of the JHM Supercharger Kit for higher levels of power and higher spinning motors, we have thousands of miles in long term testing of this automatic belt tensioning system. We used all of this knowledge and testing to release the JHM Automatic Tensioner Conversion Kit for those with either OEM or JHM 5-rib pulley setups. We've also incorporated this Automatic Tensioner into our 6-rib Pulley Upgrade Kits. 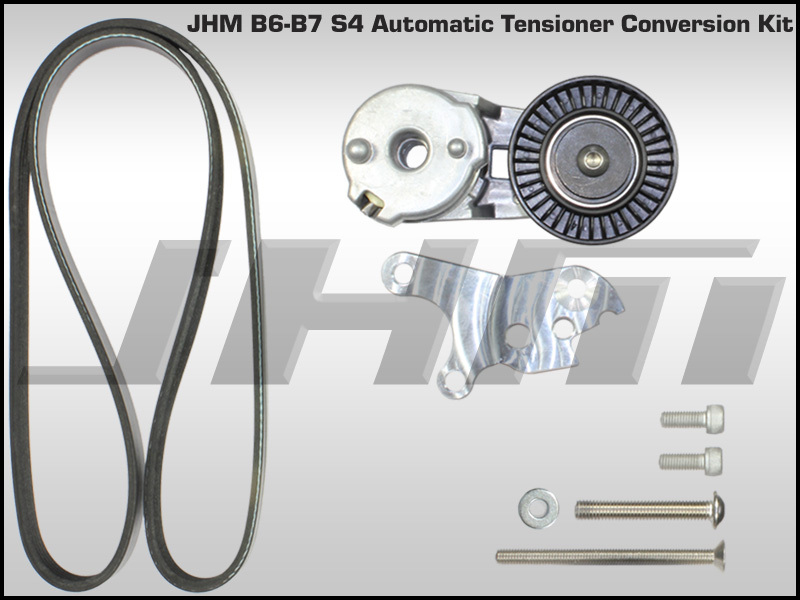 The biggest advantage to upgrading your OEM alternator belt, pulley, and tensioner setup to our JHM Automatic Belt Tensioner setup is that you no longer have to worry about the tension of your belt! No more worrying about whether your belt is tight enough or wondering if it's too loose. 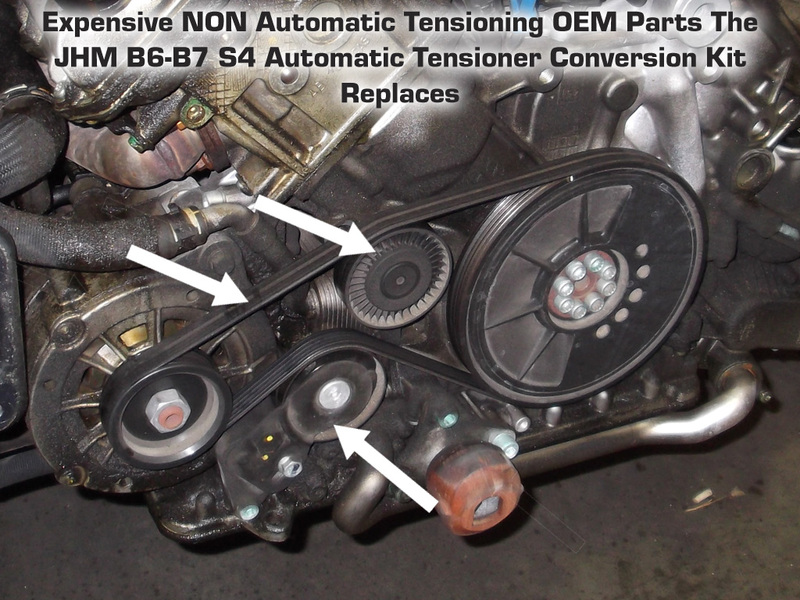 Improper belt tension can cause a lot of problems on the B6-B7 S4 and C5-allroad 4.2L: If it is too tight it can wear out alternator bearings and/or the belt prematurely. On the other hand, if the belt is too loose you can get a Battery Light on your dash indicating weak charging and in some cases thrown belts. 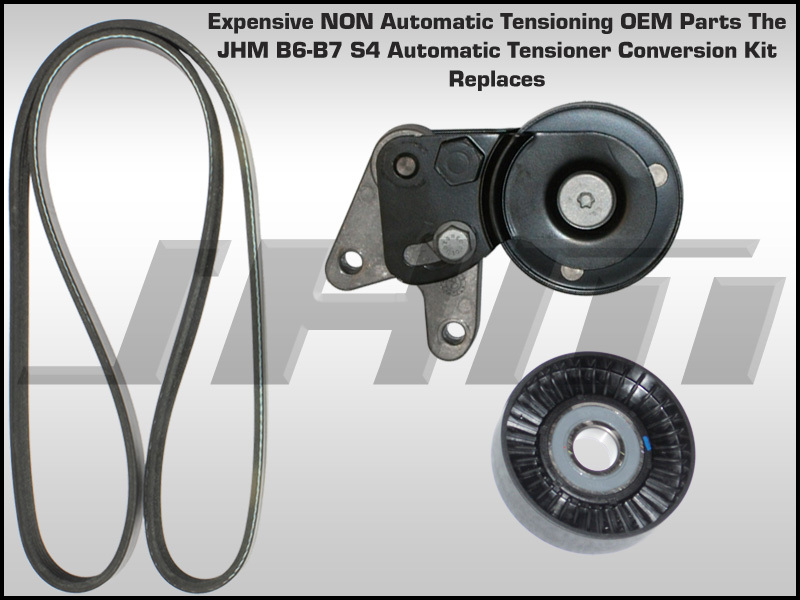 Our JHM Automatic Tensioner Conversion Kit will also fix the issue we have seen where people break their OEM manual tensioner by over-tightening it. These OEM tensioners are expensive to replace. In addition to the "user friendly" features of our kit, one of the best features is the price. Our kit upgrades your belt tensioning components to a setup better than the OEM parts while still costing less than the retail pricing of the OEM parts it replaces. Lastly, we've made our JHM Automatic Tensioner Conversion Kit much easier to install than the OEM parts it replaces. It's also easier to maintain. - Due to the increased width of the larger tensioner, some clearancing of the core support is required. See the installation notes included in the zip file linked below for more information on this. - NOTE: Tiptronic-Automatic Trans cars will need to bend the trans cooler lines in the core support as well to clear the auto tensioner arm or purchase our trans cooler kit upgrade which deletes those hard lines from the core support. See the instruction zip file above for more info and pictures. - In order to install this kit, you will need to either put the car in "service position" or completely remove the "front clip" of the car. Doing this makes it a great time to consider installing an upgraded 034Motorsport Snub Mount and a 034Motorsport Zero Gap Snub Bracket.